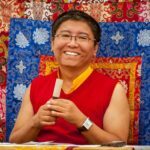 For over 25 years Tsoknyi Rinpoche has been teaching students worldwide about the innermost nature of mind in the Tibetan Buddhist tradition. Born into a family famed for its spiritual attainments, he was identified while still a small child as the third Tsoknyi Rinpoche and given the special education and upbringing of a tulku, or reincarnate lama. His teachers include some of the most renowned masters of Tibet. Widely recognized as an outstanding meditation teacher, he is the author of three books: Open Heart Open Mind, Carefree Dignity, and Fearless Simplicity. Tsoknyi Rinpoche teaches worldwide at more than 50 retreat centers for monks and nuns who follow his spiritual direction. His most current humanitarian project is completing a large school for impoverished young girls in Nepal with both Western and traditional buddhist educational curriculums. His personal warmth, humor and compassionate attention greatly enrich and enliven his teaching. His fresh insights into the western psyche have enabled him to teach and write in a way that touches our most profound awareness, using metaphors, stories and images that point directly to our everyday experience. Rinpoche is one of those rare teachers whose lighthearted, yet illuminating style appeals to both beginners and advanced practitioners alike. He is truly a bridge between ancient wisdom and the modern mind. He has a keen interest in the ongoing dialogue between western research, especially in neuroscience, and Buddhist practitioners and scholars. Tsoknyi Rinpoche’s activity greatly contributes to the preservation of the Buddha Dharma in the East, while nurturing its growth in the West. His dedication to teaching is based on his belief that the precious Buddha Dharma can bring peace and harmony to the world. 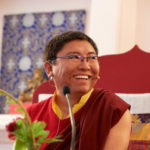 Tsoknyi Rinpoche speaks to us with an exhilarating freshness, being fully aware of the complexity of modern life and the needs of men and women today. He is gifted with an ability to unravel the most profound topics in a way that is clear and easy to understand, and as he maps out the teachings, he draws listeners constantly back to their own experience, allowing them to discover the truth of the dharma within themselves. In the depth of his understanding, he reminds me of the outstanding masters of the past, and I find it incredibly encouraging that a master as young as he is can embody so deeply the wisdom of this tradition.